The move comes after revelations about general secretary Pat Smith’s generous pay package. 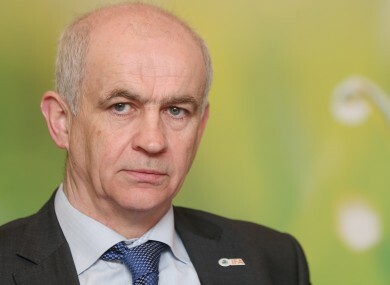 THE PRESIDENT OF the Irish Farmers’ Association (IFA), Eddie Downey, has said he will step back from his role to facilitate a review of top level salaries in the organisation. The IFA last night announced former chief economist Con Lucey has been tasked with reviewing renumeration, following the revelation that general secretary Pat Smith received pay packages of €535,000 in 2013 and €445,000 last year. He has since resigned from his role. In a statement the organisation said Downey “wished to give Con Lucey and the association the time and space to thoroughly review the situation and therefore would step back to facilitate the review”. Mistakes have been made and I want to apologise for that. Steps have been taken to ensure that past mistakes are never repeated. Deputy president Tim O’Leary will undertake the functions of the president in the meantime. Last night he pledged to “rebuild the trust of the association’s membership”. There will be full transparency and accountability from now on. He took the opportunity to disclose his own salary of €35,000 for his role as deputy president. Downey’s salary was revealed to be €147,000 a year. These figures are currently under review and Lucey is due to report back within weeks. Email “IFA pay scandal: President steps back as review of top salaries begins”. Feedback on “IFA pay scandal: President steps back as review of top salaries begins”.